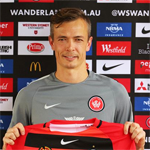 Description: With the Wanderers in a dire situation halfway through the 2016/17 season, Tony Popovic signed 35 year old Griffiths from Hong Kong in a desperate attempt to bolster his attacking stocks. Having failed to score a goal in his 7 appearances he was promptly released, joining Lambton Jaffas in the Northern NPL competition. can't wait to see him play for us. "judge me on the pitch"
5 year marquee deal incoming. Unless my listening channels were clogged, the stadium announcer at the last derby introduced Griffiths as "our fixer". Hmmm. Not much has gone to plan this season, with inports and established players at least. Not much at all. i thought you'd be a huge fan due to his grey hair and craig foster likability.